Our configurator allows you to customize the bike to your preferences. Choose the correct frame size for your FUOCO TEAM Carbon! Choose between two different paint jobs! Choose the correct handlebar width for your FUOCO TEAM Carbon! Choose the correct stem length for your FUOCO Team Carbon! Choose the crank length and chain rings for your FUOCO TEAM Carbon! Please ask for other options before ordering. Comprehensive Insurance for your FUOCO Carbon. We are happy to help you with the choice of the correct frame size and the dimensions of the parts! For this you can download our bike fit chart and upload it directly to the order. 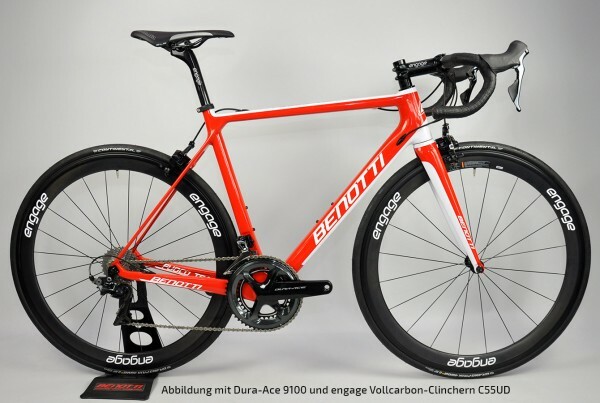 Effectivity and efficiency have a name – the 2016 version of the BENOTTI FUOCO TEAM CARBON is our new top model! The combination of a T-1000-Carbon high-performance fibre and Mitsubishi-Rayon-40-Carbon result in outstanding values regarding weight, stiffness and comfort and therewith an almost indescribably good riding sensation. The new frame only weighs 850 Gramm and with this moreover is considerably lighter than the predecessor. The extreme lightness and high stiffness of the main frame along with the very light and laterally stiff tapered full carbon fork offer an excellent riding comfort. The modified housing and cable routing make this frame an all-arounder compatible with every available groupset on the market. Fork: Carbon 1 1/8" - 1,5"
Customer evaluation for "FUOCO TEAM Carbon, Shimano Ultegra R8050 Di2"